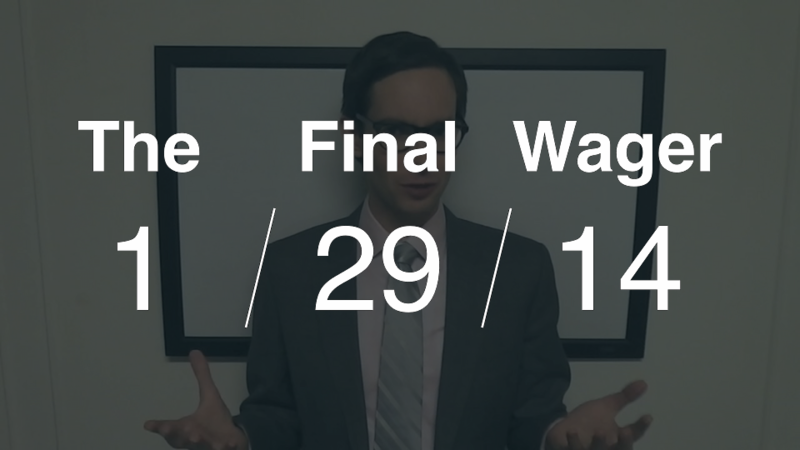 Yesterday, our champion wagered for the tie. Will history repeat itself today? If this analysis interests you, perhaps you’d like to check out my wagering tutorial? Before we begin, I’m going to talk about why exactly one should wager for the tie. There are two reasons. The first is based strictly on game theory. The whole point of Jeopardy! (see my Rule #0) is to come back the next day; you have a higher chance of doing so if you withhold that extra dollar. Whether you’re playing a proven challenger or a random player from the pool in your next game is irrelevant. Thinking about your next game is like looking down the field for the end zone before you’ve caught the ball. You need to BE in that next game for it to matter! The second is a mind-game tactic. If your opponent knows you’re going to wager for the tie, he might disregard a rational wager and go for broke in an attempt to tie you. There’s no downside for you if you’re right; you’ll come back the next day, with or without the challenger. The advantage comes when you’re both wrong. With a “proper” wager, he might beat you, but with his all-in, he’ll have zero, and you’ll increase your chances of winning. Arthur should wager 8,600 to ensure his return if he’s right. 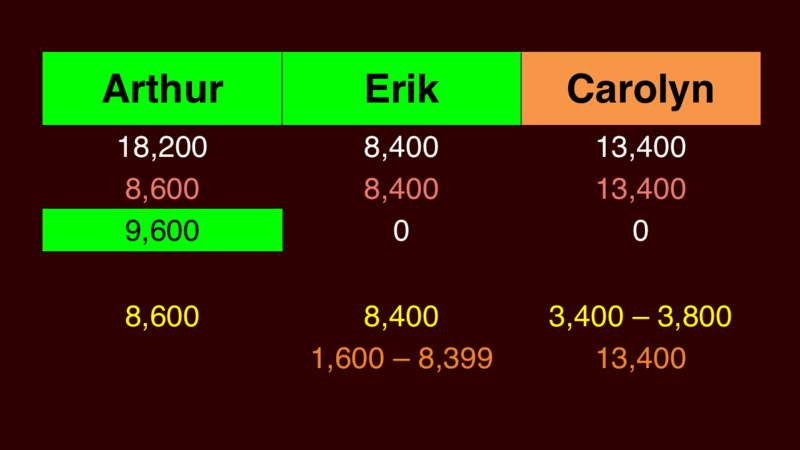 Carolyn should wager at least 3,400 to cover a double-up by Erik, and no more than 3,800 so as not to fall below Arthur if they’re both incorrect. 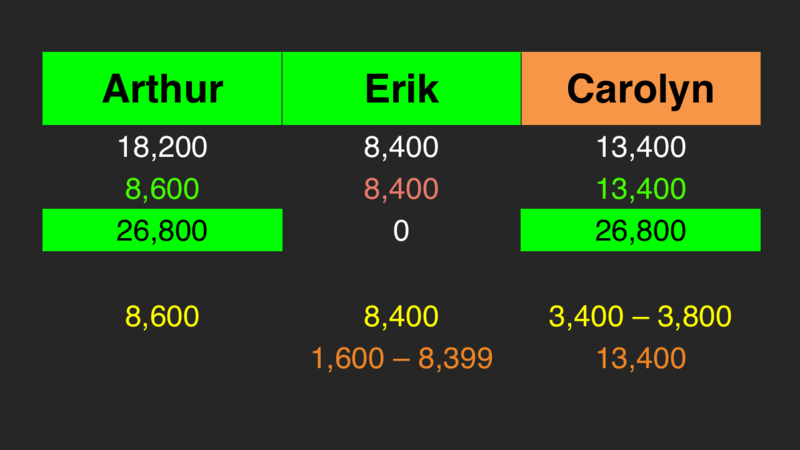 Erik needs to get it right to have a shot, and wager at least 1,200 against Arthur, and 1,600 to cover a rational incorrect wager by Carolyn. At that rate, he should wager everything to maximize his chances of winning. Now, since she’s seen Arthur wager for the tie already, Carolyn is fully justified in wagering everything – not a dollar less! And that’s what she did, and she’s rewarded with $26,800 and an invitation to Thursday’s match. To demonstrate my second point above, let’s look at what would have happened had the question turned out to be a head-scratcher. Arthur would have won by virtue of being the only player with money. Now, had Carolyn wagered “rationally” and the clue stumped all three participants, she would have emerged victorious. Yet, Arthur still would have won had he gotten it right. In other words, no difference if he’s right; but, perhaps, a world of difference if he’s wrong. Correct response: What is Vaduz or La Paz? What about the issue of then playing against someone who has real Jeopardy experience rather than folks who are brand new. He won, of course, but I would think that would be a factor as well. It’s a valid concern, but I think it’s far outweighed by the value-bump you get from goading your opponent into wagering everything. Why should Caroline bet 3,200-3,800 instead of 13,400? If she bets 3,800 and Arthur bets 8,600, Caroline wins only if Arthur is wrong. If she bets 13,400, she wins only if she’s right. Odds are the same in both cases (2/4), so wouldn’t you rather bet on the scenario where you’re right vs. the other person is wrong? In most cases, you assume the leader will tack on the extra dollar. In that case, if Carolyn wagers everything, she’ll win only when she’s right and Arthur is wrong. If Arthur misses and Carolyn wagers “small”, Carolyn will still win if she’s right, and will also win if she’s wrong (third player notwithstanding). Because Arthur had already shown the propensity to wager for the tie, the all-in bet is rational here, but I generally advise against it unless you HAVE to get it right to win (see my discussion of the game on Friday, January 31). I guess I don’t understand how wagering the extra dollar would hurt Arthur here, and if he wagered the extra dollar it could potentially knock out a player that proved worthy rather than letting her through and giving her the extra day of experience. In hindsight, given his opponents’ wagers, the extra dollar wouldn’t have hurt. The point is to maximize your chances of returning the next day regardless of what your opponents do, and withholding that dollar does that. Your game theory strategies ignore one very important point. The estimated chances of you and your opponent answering the question correctly. For example, if you are the leader and your chances of answering correctly are 100% then clearly you should wager everything to maximize your earnings. If it is not 100% but very high then it is still probably correct to wager everything although at some point you have to consider your expected future earnings. The best way to make more money on Jeopardy! is to play more games. Plus, you can never guarantee you’ll know a Final clue. Ken Jennings, a huuuuuuge comic book fan, missed an FJ! in that category in his 39th game. What people overlook is that if there is a tie, both “winners” come back and both get the money they win. A tie is a win for both – they don’t have to split the money. If they had to split the money, then I believe that the optimal strategy would be to add the extra $1. Furthermore, since the players get to play more than once, it is likely that over time more and more will figure out how to play optimally – allowing more win/win scenarios. First of all from a humanitarian view, it’s better to end in a tie. You sacrificing $1 allows another player to win whatever amount they end up with for the day. Aside from these two strategies, I believe it’s actually BETTER to bring back an opponent you already know as opposed to an unknown person. You’ve already proven you can handle that opponent since you were the one in the driver’s seat. Everybody mentions this hypothetical situation as if the next unknown challenger is worse than the one you helped bring back. It very easily could be the opposite. By you bringing back the current contestant you could be preventing the next Ken Jennings from competing against you. I’d rather play against the person I already know I could beat than an unknown player. As opposed to a short term, make it to the next day strategy, this seems to be a long-term strategy. Arthur wants his opponents to know he’s betting for the tie, thus increasing their bet and increasing his chance to win with a wrong answer. This knowledge — that he’s not doing the traditional dollar add — changes the definition of a rational wager, so unless Carolyn knows Arthur’s strategy, the strategy doesn’t help. By allowing Carolyn to tie and advance Arthur is likely to improve his chances of making money on the next day. If the situation is reversed the next day (Carolyn is in 1st place), presumably she would be more likely to allow Arthur to tie. The ultimate Jeopardy strategy would be for all players to work actively throughout, even to the point of deliberately giving incorrect “answers”, to reach a three-way tie and ensure their lifelong return every night.